So yet another controversy when it comes to social media. 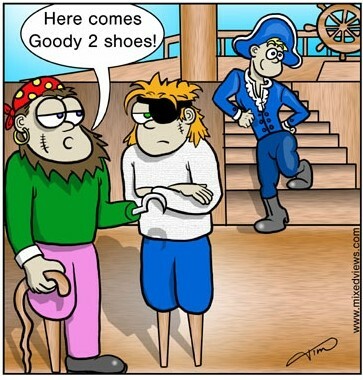 I woke up to a plether of IM’s, Private Tweets and emails, to find out I’m a “Goody2Shoes”. I guess I could be upset, but I’m not. It’s par for the course in the world of Search these days. I could lash out at SEOMoz, because as many have pointed out, they let a post go to their own blog that attacks competitors (It has now been edited, but point being they originally let it out with the rather rude attacks on Matt Cutts, Lisa Barone and myself). I’ll let all those comments on the post speak for themselves. I’m sad that SEOMoz chose the path of inciting drama and discourse, but in the end that’s Rand’s business decision where to take his business, not mine. The drama gets the site links, and traffic, and I guess that trumps everything. As for what Marty wrote about both Lisa Barone and myself and choosing to post it on SEMoz rather than taking ownership for it on his own blog, I can only guess he really needed the larger audience for the message he wanted to convey. I read Marty’s apology, “Lii and Lisa are pillars in this community…”, while I’d like to think it’s genuine, I was on the panel in Toronto, where I heard his example of vanity baiting in his presentation, I can’t help to think and question that this might another example of it. As for my stance, I also guess when you take a position that fake profiles on StumbleUpon, and adding lots “fake” friends to make yourself look more popular, is not a sound strategy for entering the social media space, undoubtedly you’ll get flack, from those who find no flaws with this strategy. It happens, we all have different moral compasses, we all have different things that drive us to be what we perceive as a “great marketer”. Now if everyday people (not marketers) are saying this about these strategies, why would I advise my clients to implement those strategies? I wouldn’t and I wouldn’t promote doing this in a session at a major online marketing conference. I don’t see how creating fake profiles (or avatars) gains anyone any kind of ground in the end, when you are found out to be a fraud, all trust is lost. What’s wrong with being honest? Really now, what’s wrong with starting a conversation, and honest one with real brand representatives, not one greeted immediately by fake/automated avatars that want to be my friend? The only reason I can understand why SEO’s seem so fascinated with “gaming” social media by creating fake avatars and adding all these “non-friends” is for power and links. That’s really not what social media is about, not to the people inside the communities – only to SEO’s does this seem to matter. If advocating that in social media, marketers be real, engage honestly in conversations with an audience or their customer, is deemed as “Goody 2 Shoes”, well I’ll gladly, and proudly wear that badge. This entry was posted in Industry Happenings, Online Marketing, Ramblings, Social Media and tagged Social Media, social media ethics by Liana "Li" Evans. Bookmark the permalink. Li – just wanted to make sure you knew the order of events and how it played out, so you’re not under any false impressions. Yesterday, Marty submitted the post, Rebecca skimmed (not carefully) and published to the main blog. Not her best move, but she assumed that someone like Marty, who we know personally and have spent plenty of time with wouldn’t make any big errors of judgment. Last night around 10:30pm, I read the post, didn’t like what I saw, and commented about it. I also emailed Rebecca & Sarah. I’m not in the habit of second-guessing anyone’s work here at SEOmoz, particularly in public. I think a great company needs to respect the work its employees do, so I certainly wasn’t go to pull down the post or override Rebecca’s decision until I conferred with her. I also emailed with some others who had been offended by the post (I’m sorry that I didn’t shoot you an email as well). I hope no offense was taken, and I’m sorry for the part that my company’s content-distribution/social-media/ugc-blog-platform played in it. Please do give Marty a second chance as well, I think his intentions are much more benign that the message that came across. Thanks for the explanation Rand. No hard feelings. The techniques Marty and others have advocated are amusing and have great entertainment value at conferences. While these techniques might work in the short run, I’d place these methods in the same category as invisible text, cloaking, etc…they are short cuts that might work in the near term but carry risk that they may damage the reputation and image of the client. They aren’t worth it. I cannot advocate such techniques for REAL clients…nor are they necessary. If you have good products and services you don’t have to fabricate avatars and the rest. Real live customers love giving reviews and testimonials. Honesty and integrity may be old fashioned, but they are still the right way to do things….apparently I’m not alone in my thinking on this as we’ve received a number of emails of support. I was also touched by a post by Andrew Goodman with whom I share sentiments. It’s pretty disappointing if that’s what you think our intent was. Rebecca what else are we suppose to think when you put it up, promote it to the SEOMoz blog. Then when there’s an outcry, “clean it up”, put it back down to YouMoz again. We all think it’s over and done with and believe Rand is sincere with his approach. Then late yesterday you put the article back out there, without the original comments (100+) that were first on that posting. I’m sorry, but it just really says to a lot of people, “drama gets the site links, and traffic and I guess that trumps everything”, including us here at KeyRelevance. Excellent post Liana. Rand seems sincere, Rebecca, bent out of shape. Okay, I think we’re all tired of this and want closure. I think something that would help put this whole mess behind us would be to put a note at the beginning of Marty’s new version of the article that states this was a re-write and links back to the original comments. They are part of the history of the article so there should be an easy way to connect them. Then let’s all move on with our lives…it’s summer and a weekend. Time for everyone to quit biting at each other. Get away from the computer for a while and let’s all go have some fun. I just wanted to add a public apology and more complete explanation here – http://www.seomoz.org/ugc/the-buck-stops-here. Thanks so much for taking my call this weekend, too, Liana. Thanks Rand. I appreciate your sincere efforts. I really hope people learn from this, both inside your company and people outside watching. Great post. This topic is relevant to all the maybe questionable topics in our industry (good examples of cloaking, etc. as we all know how those fared in the long run;) AS SEO professionals we all need to decide how we execute our strategies. My biggest hope for the industry is that we are transparent with our clients about our tactics. (I would have a hard time selling a very conservative corporate client on fake avatars). What is the single best search engine optimization (SEO) tool to help position a brand new website on Google?